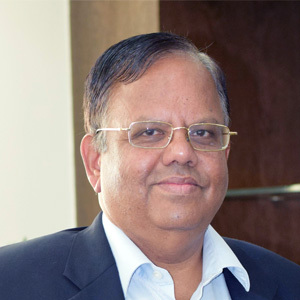 Mr. Srinivasan is the Founder Chairman of eMudhra Limited since its inception in 2008. Prior to this, he was the Managing Director and Global Chief Executive Officer of a Global IT Company having more than 10,000 employees servicing a large number of customers in over 50 countries across 5 continents having a revenue of about 500 Million since April 2009. Having travelled widely around the world, he has a deep understanding of global business issues. Prior to this he was Senior General Manager in ICICI. Mr. Srinivasan combines a comprehensive mix of academic qualifications and professional experience. He is a graduate in Mathematics from Madras University and secured the First Rank in the university. Apart from being a rank holder in the Chartered Accountancy examination, he is also a qualified Cost and Works accountant and a Company Secretary. He had also attended the Executive Development Programme at the Kelloggs School of Management in Chicago, USA. Mr. Srinivasan had also authored a book titled “New Age Management Philosophy from Ancient Indian Wisdom” based on his learning from the Thirukural, a 2000 year old Indian text. The foreword and preface for the book has been written by veteran bankers Mr. N. Vaghul and Mr. K.V. Kamath. The book has been very positively commented by veteran business leaders like Mr. N.R. Narayanamurthy and Mr. R. Sheshasayee. Mr. Srinivasan was also a guest speaker in reputed management schools like INSEAD, MIT, Harvard, IIM, Great Lakes etc. Mr. Srinivasan is the Chairman of India PKI Forum, a body sponsored by the Controller of Certifying Authorities, Ministry of IT, Govt. of India, for the development of Digital Signature Industry. He has presented papers relating to Digital Signature Industry in the Asia PKI Consortium.